A reported deadline for developers to comply with an Apple policy on in-app subscription content has passed, with some developers yet to modify their apps. But Macworld has learned that Apple is working with developers to bring their apps into compliance as the company will look to start enforcing its new rules. First announced in February, the in-app content rules came as part of Apple’s subscription system, requiring that apps offer in-app content for the same price regardless of whether it was purchased via the app or outside of it. Apple later revised the rules, instead just requiring that developers remove any links to external sources for purchasing content accessible from within the app. At the time of the policy’s announcement, All Things Digital reported that a memo from Apple to publishers had set a deadline of June 30 for compliance. However, sources tell Macworld that the deadline was less of a hard-and-fast date than a rough target for bringing apps into line with the new policy. Netflix has side-stepped the restriction by adding a note on its login screen without a link. Some developers have already begun to make the necessary changes. Last month, video-streaming provider Hulu updated its Hulu Plus iOS app, dropping a link that allowed users to visit the company’s website to sign up for a paid subscription. 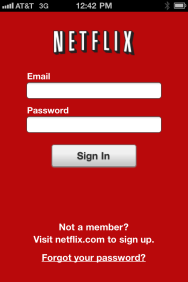 Others, such as Netflix, have exploited a loophole: The login screen for the video-streaming app tells users to “Visit netflix.com to sign up” but does not provide a tappable link. 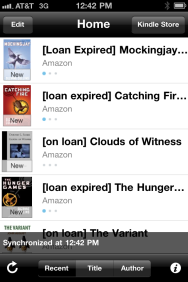 Kindle's iOS app still has a Kindle Store button. Other developers have not yet updated their apps as of this writing: Amazon’s Kindle ebook reader, for example, still prominently features a “Kindle Store” button; other e-readers such as Barnes & Noble’s Nook app and Google’s Google Books app still have links to their own stores as well. However, Macworld’s sources can confirm that Apple has been working with various prominent developers to help them ensure their apps comply with the in-app content policies; expect to see updates to these apps in the near future. Some less prominent apps will likely be pulled from the App Store as Apple starts to enforce the rule changes, but developers ought to be able to return to the store simply by updating their apps to comply. Apple’s bet is that developers will comply, but that’s no sure thing. Many developers have not been shy about voicing their criticism of the new policies, which not only gives Apple a 30 percent cut of all content bought through apps but also restricts how apps can point customers toward purchases outside of apps. Apple, for its part, maintains that the change is to benefit consumers by providing a standard way to purchase content through apps. But the visibility of in-app purchase can potentially help boost volume of those sales, which may help make up for Apple’s cut. It’s a tricky balancing act for developers, but the popularity of iOS as a platform may for many outweigh Apple’s 30 percent—especially when the alternative is to not be in the App Store at all.